In the US (and many other industrialized countries) we love sugar. In fact, according to the USDA, Americans consume an average of about 156 pounds of sugar per person per year – 156 pounds!!! To provide some perspective, that is thirty-one (31) 5-pound bags of sugar per person, every year. To break that down even further, that’s about 44 teaspoons of sugar EVERY DAY. There are many (MANY!) harmful health effects to this amount of sugar consumption. First and foremost, consuming this amount of sugar will lead to radical blood sugar fluctuations, causing a state of insulin resistance (insulin resistance is when the cells get bombarded with insulin (in response to elevated blood sugar) and they begin to tone-down insulin receptors; in essence, the cells stop listening to the signals insulin is sending). This causes the body to store all this sugar in body fat, leading to excess fat accumulation as well as a chronic state of inflammation. Once more, regular sugar consumption is known to increase free radical damage in the body, which can cause something known as mitochondrial dysfunction, where the cells can no longer create the energy necessary for proper functioning. If this goes on long enough, our body does everything it can to adapt to this new state of being. We call these adaptations “diseases”. 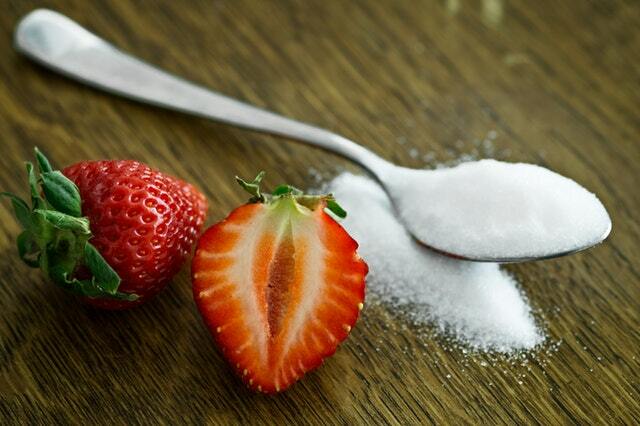 Lastly, sugar requires many nutrients in order to be processed into usable energy; since most of these nutrients have been processed out of most products that contain high amounts of sugar, the body must steal them from other sources within the body itself, creating nutritional imbalances and deficiencies that can further hinder energy production and promote inflammation, pain and multiple diseases, including diabetes, cardiovascular disease, mood disorders and cancer. Energy drinks, soda and soft drinks account for the largest percentage of the average American’s sugar consumption, equaling about 16 tsp/day (or about 67 grams sugar/day). To get that amount of sugar, the average American drinks almost two 12-ounce cans of soda every day. That translates into almost six-hundred (600!) 12-ounce cans of soda every year or roughly 54.5 gallons of soft drinks/energy drinks every single year. If you’re more of a visual person, I encourage you to visit a website called Sugar Stacks (www.sugarstacks.com). There you will find not only a visual to help you understand how much sugar there is in soda and energy drinks, but also other beverages (like commercially available teas, juices and coffee drinks) and other foods. Seeing how much sugar is in these “foods” will help drive home the fact that there is no way this could every be good for us and that it has to change if there is any hope of reducing the incidence of obesity, diabetes and/or inflammation and pain in our world.